WASHINGTON — Bernie Sanders is expected to spend his final primary night meeting with Democratic rival Hillary Clinton — not before thousands of cheering supporters — as his campaign seeks to influence Clinton’s agenda against Republican Donald Trump. After spending a long weekend in Vermont, Sanders will meet Tuesday with Senate Democrats during their weekly luncheon, following up on meetings last week with Senate Democratic leader Harry Reid of Nevada and Sen. Chuck Schumer of New York, the party’s incoming Senate leader. “He hopes to have a good discussion with (Clinton). 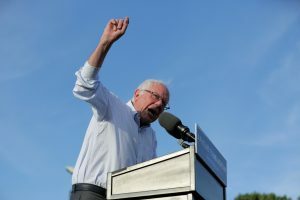 After that we’ll think some more about the next steps of the campaign, but he has made it clear that the campaign will go to the Democratic National Convention in Philadelphia where the issues that he fought for will be discussed,” said Sanders spokesman Michael Briggs. Sanders has opened up his campaign’s massive email donor list to several Democratic candidates, hauling in more than $2.4 million for his allies. Flores has been the top recipient of those appeals, collecting about $390,000 from an email Sanders sent in April on behalf of her and two other candidates. Associated Press writer Dave Gram in Burlington, Vermont, contributed to this report.